Hello and happy Saturday! It is our first normal weekend back home from Brazil. I think we might have just the teensiest bit of jetlag still as we have both been out of bed since 7AM – something I love to do and my other half is not exactly known for. 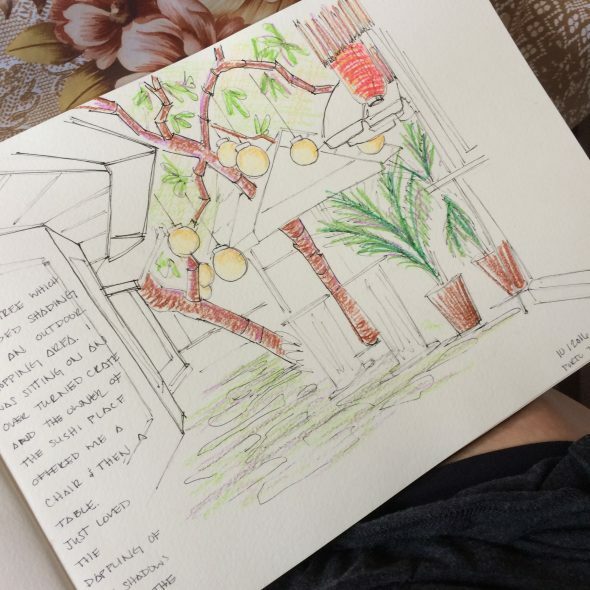 I thought I should share some of my sketches from Brazil! I have to be honest here. Most of the time I did not actually draw right on site. When you’re with a group of people who do not sketch, it’s a little difficult to stop, drop and pull out a pen and paper. There were a few good days though. The sketch of Botofogo Beach above I actually did draw right on site, in a space of less than ten minutes. I added colour to it later. 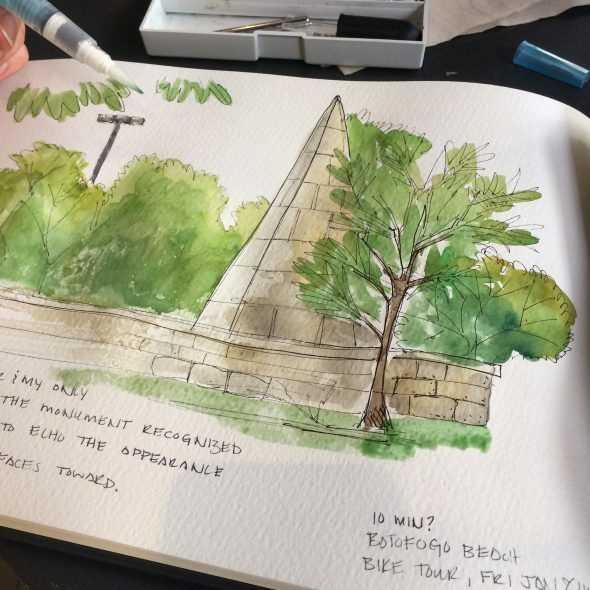 Everything the Urban Sketchers say about travel sketches is true – that looking at the sketch truly brings you back to the moment you were there. We did a bike tour through Rio where I was able to take a ton of reference photos, but this particular sketch we stopped by a minivan selling coconuts under a shade tree so everyone could take a minute to catch their breath. This monument was a gift recognizing Rio de Janeiro as a city, and was meant to echo the appearance of Sugarloaf Mountain, which it faces. As an aside – it looks nothing like Sugarloaf. That’s just me. Sketch #2 was also drawn on site! We were at Porto de Galinhas for the day, a really pretty beach town and tourist attraction. It’s summer break in Brazil right now (so backwards!) so there were a lot of families out for the day, and I am told it’s a really popular honeymoon spot as well. Some interesting history about the name – Porto de Galinhas is literally translated to a port for chickens. It was actually a port where slaves were off loaded for work in the fields, mostly sugar cane is my understanding. Interesting as this relates to my capoeira background, but sad too for obvious reasons. Galinhas essentially became a moniker for slaves. Chickens were a common theme among the souvenir’s you could buy in all the locales we visited. This particular day, I’d had too much sun and left the group (and missed out on a wicked fun capoeira shoot they did) to go sit by the shops and sketch. I had a group of girls come to look over my shoulder and then proceed to take my book and look through it. They were probably about ten years old. One kept asking me very slowly where I was from and it took a while for the word ‘country’ to ring a bell in my memory banks. Too funny. While in this spot a very nice sushi shop owner also came out to offer me a chair – I was sitting on a crate I’d seen set beside a closed store. Might have to add a little stool of sorts to my travel kit. This is the spread at the kitchen table of the place we stayed in Recife. That was the capoeira intense portion of the trip, and this shot was taken early morning while everyone else was still sleeping. There were five of us staying in a house with one bathroom. I kept the alarm on my cell phone the entire trip so that I would wake up every day at seven. This gave me first dibs on both the coffee pot and the bathroom, and a few golden morning hours to do my thing while everyone was still sleeping and I wasn’t holding anyone up. Golden. So that’s it for today – just a smattering of my messier works. It brings back memories of the trip. I would daresay that one week later I am still in the afterglow stage, feeling refreshed but also eagerly tacking on all the usual activities we do at home. You know how as the workweek slowly takes it’s toll you become less active? More inclined to peruse your social feeds, or spend a few extra hours in front of the television instead of engaging in your hobbies? That’s what I’ve been determined to avoid so far. Go to work, be fully present, but then get back to the things that make me happy. 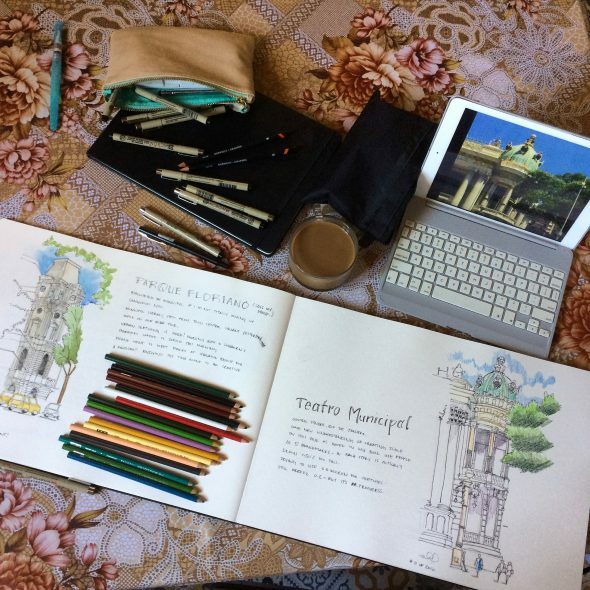 For me that’s capoeira and sketching. This entry was posted on Saturday, February 6th, 2016 at 10:30 am. It is filed under General Musings and tagged with Brazil, Musings, resolutions, travel sketches. You can follow any responses to this entry through the RSS 2.0 feed.